Mother Nature got the temperature right for Fall and Autumn week but dropped the ball on the leaves changing colors part. Although the leaves remained green, the students managed to find individual leaves that had changed colors – particularly those students who headed up north over the weekend! 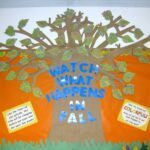 On Monday, the teachers took down the leaves from the “Watch What Happens in Fall” bulletin board. Since the leaves would soon be changing color, the students had to change the color of their name leaves as well! 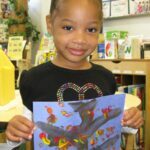 Using watercolor paints, the students helped their leaves turn from green to all different beautiful and bright colors! 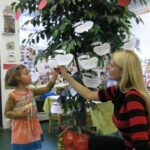 Once all of the leaves dried, the teachers then placed them back on the tree branches to show what happens as the season progresses. In the afternoon, the students learned some new fall songs and thoroughly enjoyed that the new songs had the same tune as some old favorites. Below is one song that the students learned. On Tuesday, the Autumn fun kept going. This time the students learned about a very familiar fall item from the park – acorns! 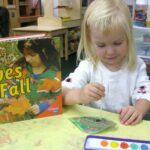 Borrowing a friend’s book, the teachers informed the students that acorns are not only what the squirrels eat but they are also what oak trees grow from. 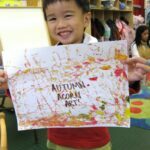 After collecting a whole bunch of acorns, the students created some Autumn Art using paint but not paintbrushes. 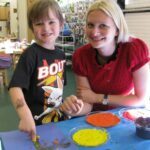 The students painted their projects with acorns! 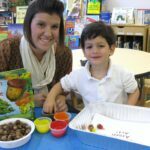 First, the students dipped their acorns into different fall-colored paint and placed them onto their paper in a large tray. 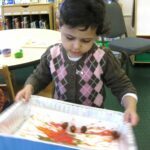 Next, the students shook the tray side to side to spread the acorns, but more importantly the paint, around. Finally, the students collected the acorns and took the paper out of the tray and Viola! Autumn Acorn Art! Later in the afternoon, the students got to shake out some of their sillies by dancing along to some more Fall/Autumn songs. This one was a real hit- once it was extended by the teachers! Scarecrow, scarecrow, wiggle your toes. Scarecrow, scarecrow, face the door. Scarecrow, scarecrow, sit on the floor. On Wednesday, the students learned about a popular Fall favorite – apple picking! 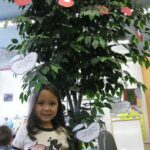 The students learned all about where apples come from and how they grow. Later, with a little help from some construction paper and tape, the teachers turned our large decorative classroom tree into the Park Prep Apple Tree! The students came up to the tree and picked off their apple. Then, the students decorated their apple however they deemed fit. They turned out beautiful! In the afternoon, the students practiced a new Autumn song. Bright as it could be. On Thursday, the students created a beautiful fall tree art project. 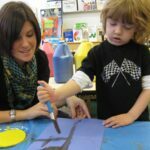 Using a paintbrush, the students traced the outline of the tree that the teachers had drawn. Next, they dipped their fingertips into different fall colors to create the leaves on their tree. The tree art projects turned out to be beautiful! 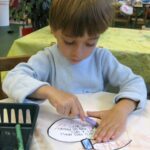 On Friday, the students made leaf rubbings using a crayon and some paper. 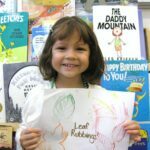 The rubbings looked so nice and the students really had a blast picking out which leaf pattern to rub onto their papers. In the afternoon, the students took a break from Fall/Autumn week to celebrate something very special that is also taking place in Autumn – Miss Justine’s Wedding. The students each took turns hugging Miss Justine and saying their “good luck” and “see you soons!” as she will be out of school for a few days while on her honeymoon in beautiful Italy. The students started out doing a great job waiting their turn but quickly became a little impatient. Safe travels and we’ll see you soon! We hope everyone has a great weekend – especially you, Miss Justine! Wow! We learned so much about Fall and Autumn this week. Next week we venture into our alphabet curriculum! It’s going to be Awesome, Breathtaking, Crazy, Dazzling… well, you get the idea! We will also be dividing up the students into their morning meeting rug groups and beginning our afternoon Spanish Language program! See you then!